Not all distributions comes with all essential applications for daily usage, Agree? You have to install additional Repositories, softwares like Chrome, Flash player, Java or something in order to get a perfect distro for the daily usage. To do that, there are two methods. First, you can manually search and install all the required softwares one by one, and the second one is you can use a tool that will help you to find and install all essential applications from one place. Which method would you prefer? I prefer the second method most to save some time. PostInstallerF is a small, lightweight, useful tool that can be used to install 100+ essential softwares, Games, audio/video codecs, and third-party repositories which are not included by default in Fedora, Ubuntu and Manjaro. Initially, It was built only for Fedora distributions, but now it supports some other popular distributions such as Ubuntu and Manjaro. You need an Internet connection to download and install the packages. Keep in mind that PostInstallerF is not a Software Center. 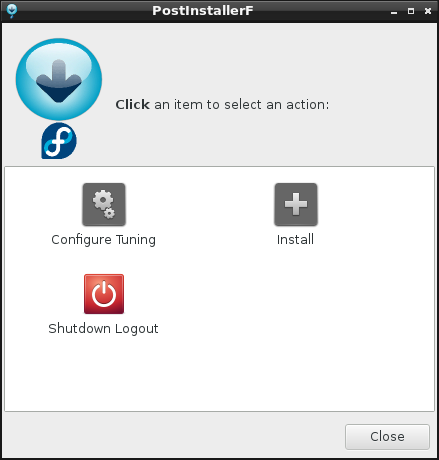 Run the following commands one by one to install PostInstallerF on Fedora systems. Update the software repository, and install PostInstallerF. Run the following commands from your Terminal. Launch postInstallerF either from Menu or Unity Dash. 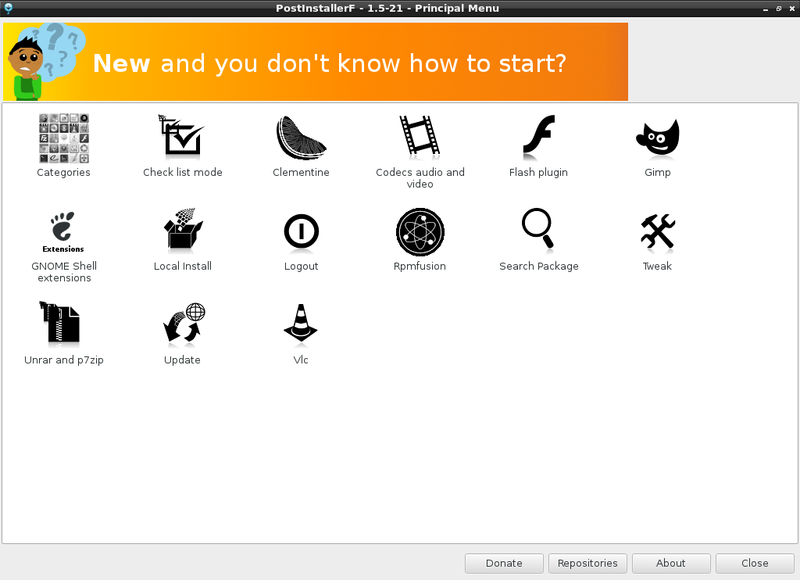 This is the principal menu (main menu) of PostInstallerF. As you in the above picture, You can do the following from the Principal menu. Click on the Update button to update your distribution. 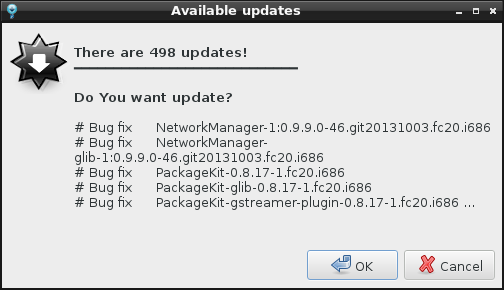 Click Ok to install updates. PostInstallerF has divided applications into categories to make it easy to find a particular type of application. Also, you can search applications directly from the principal menu using Search Package button. Click on the Categories button from the main menu to list the available packages. The Categories section makes easier to find a particular kind of application. The packages are grouped into separate groups, so you can navigate to the desired group and pick an application you want to install. For example, I am going to install Firefox browser. Go to the Network category, and double click Firefox application to install it. Now, PostInstallerF will download and install the Firefox application. This section is interesting and very useful too. This section allows you to install the best programs, to configure/tune your system functionality, or to shutdown/logout the system. 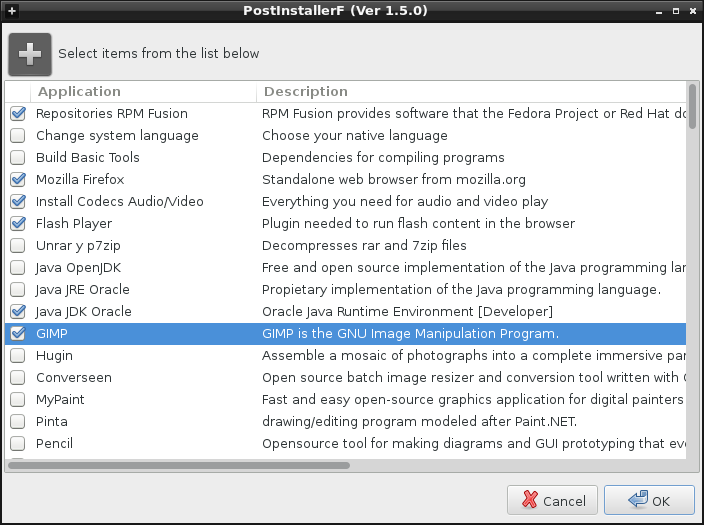 For example, If you want to install the best programs selected by PostInstallerF on your system, click on the Install button. The following screen should appear. Select the applications you want to install, and hit the OK button to install all applications at once. Or you can manually search and select the applications using the Categories option as shown above. 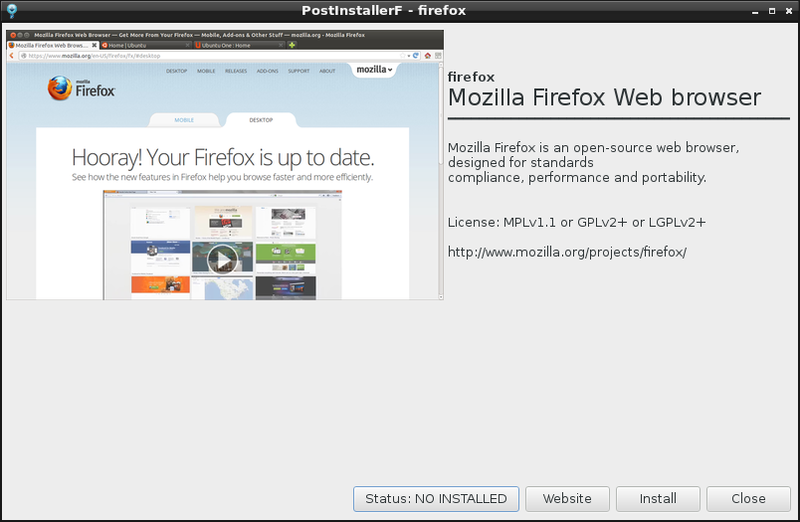 Now, PostInstallerF will start to download and install the selected applications. Do you want to tweak your system as the you want it? then it is possible too. Click on the Tweak button in the principal menu. This section allows you to do the following things. This tool is really impressive, easy and useful. It saves me lot of time to install perfect full-fledged desktop after a fresh install. Hope this tool will useful. Give it a try, you won’t be disappointed. You might want to try Fedy which is very similar to PostInstallerF. Fedy supports only Fedora, whereas PostInstallerF supports Ubuntu and Manjaro.